Free Calls From Mobile to Philippines (landline/Mobile) by Air4 | Free Pc to Phone Calls, Free Voip Calls to India International ! We have a good readership on this blog. A significant part of our blog readers are looking for ways to make free calls to Philippines. 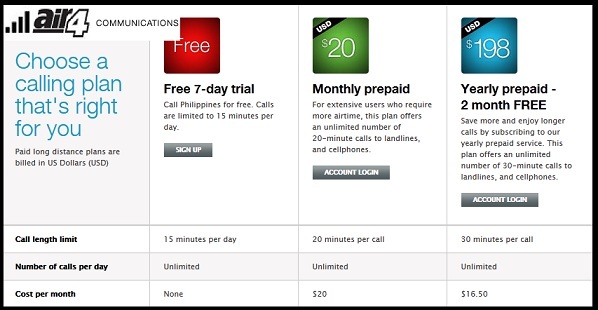 In the past, we have posted about an offer for Free Philippines Calling by Rebtel and it proved to be a big hit. However as that offer soon expired, we were forced to look out for some other options. Though it is one of the most called destinations, but the call rates ain't cheap (infact we would call them costly). The price range varies from 10-15 cents per minutes for voip providers and some telecom companies charge more than 25-50 cents per minute. So today we will be discussing one voip provider which is offering free unlimited calls to Philippines (both mobiles and landlines). We are talking about Air4 Communications (Air4.ca) which is offering various calling plans for Philippines. We will be discussing in details all the calling plans offered by them, but one such plan is really exciting. Lets see how. - For extensive users who require more airtime, this plan offers an unlimited number of 20-minute calls to landlines, and cellphones. - Save more and enjoy longer calls by subscribing to our yearly prepaid service. This plan offers an unlimited number of 30-minute calls to landlines, and cellphones. Air4 : Free 7-day trial to Philippines. Call Philippines for free via PLDT Landline, PLDT Landline Plus, Globe, and Sun! - Free to sign up. - You get 15 free minutes per day. - You can make unlimited calls to Philippines mobiles or landlines (capped to 15 minutes per day). After you have signed up for the plan, you will be asked to verify your mail. Once verified you are ready to make calls. Air4 will give you SIP details. This is very cool thing, you can configure any SIP client (on your PC or Mobile) and make SIP calls using Air4. Using SIP you can call Philippines for free from your iPhone, iPod Touch, iPad, Android Mobile, Blackberry, PC (Windows, Mac OS) or Windows mobile. Moreover Air4 also offers userguides for setting SIP in various client (Microsoft Windows or Apple iPhone/iPad). Well, here is another good thing about this free calling service. You can extend another 7 days by logging in to air4.ca, and selecting "Renew". You will be asked to refer 5 email addresses to activate your extension.